After the seafood month, I thought it was about time to celebrate springs, at least in California. The beauty about California is that they grow a lot of fruits and vegetables and you get quite a lot of different varieties so it’s easy to eat local and get a healthy diet but most of all varied. It’s been raining quite a lot but then clears up and it’s a sign that springs is on its way. Unfortunately France has been devastated with a lot of storms and floods, but the area where my parents live has been less severely affected. 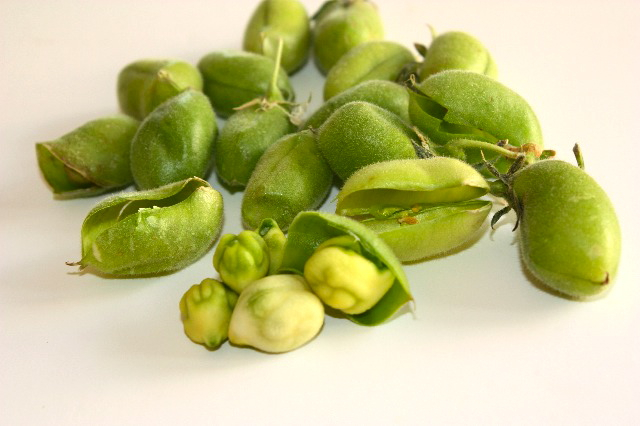 After a trip to my favorite store last weekend, to the other side of the Bay, I saw that many springs vegetables were starting to be on the shelves, among those, some beautiful fresh chick peas in their green pod. It has been a while I haven’t seen fresh chick peas, I remember my grandparents in Italy would grow them in the garden and my mom would eat them raw with a little salt, the same way you could eat fresh raw fava bean. So of course, I had to buy some, and of course I had to buy a lot. So more chick pea dishes are coming this way. Fresh chick peas can be eaten like the dry kind, and cook as fast as peas, so if you over cook them, they’ll get mushy. There is usually one or sometimes two peas in one pod, unlike peas or fava beans. They’re delicious raw and have a sweet flavor that are delightful in salads. 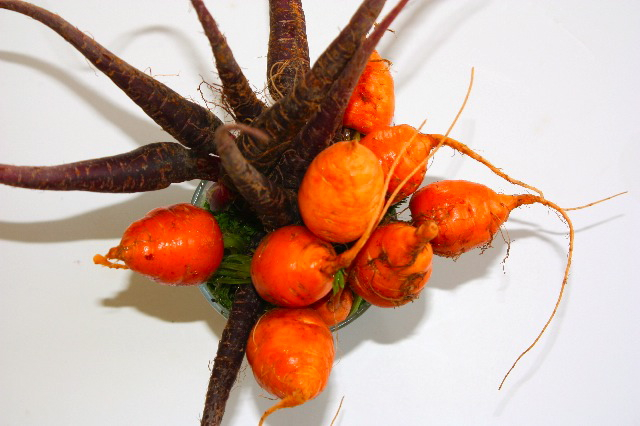 Round baby carrots are very sweet and flavorful and their crunchiness is perfect on a spring salad like this one where all ingredients are raw. I remembered this wonderful salad in Tel Aviv where they had cut the cucumbers as sticks and left it unpeeled, so that’s what my cucumbers look like. The vinaigrette is simple, I wanted a fresh, light and fruity vinaigrette that would enhance the natural flavors of all the ingredients therefore avocado oil combined with pomegranate vinegar did accentuate that particular delicious flavor you get in raw vegetables. For the vinaigrette, mix all ingredients together and mix well. In a mixing bowl toss salad with some vinaigrette. Divide the salad in each plate, add the rest of the vegetables. Add ricotta salata on top, sprinkle with sunflower seeds. Top with remaining vinaigrette. This entry was posted by silvia on March 2, 2010 at 5:36 pm, and is filed under Express - Less than 30 minutes, Salads. Follow any responses to this post through RSS 2.0.You can leave a response or trackback from your own site. Wow, I’ve never seen fresh chickpeas before. 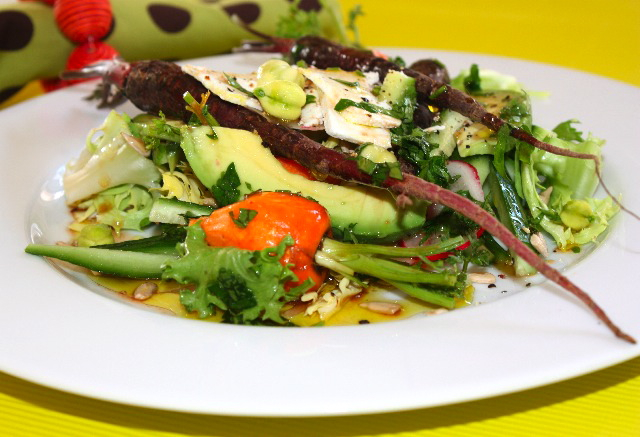 This salad looks and sounds lovely – just perfect for spring! I enjoy the recipes you create and share here. I can get fresh chick peas at my Asian market – but usually there’s so much I want I get overwhelmed and forget! I must remember, this salad is just the kind of thing I love – fresh and crunchy with different textures and colors. So nice. I have to look for avocado oil as well, sounds great. I was just in California visiting family and bought fresh chickpeas to make for them. It was great being among real food again. What a pretty salad. I’m going to have to find some avocado oil. It has to make a delicious salad dressing. Terrific pictures once again! Chick peas always come in a can or dried. I have never seen them fresh before so I will either need to grow them or watch for them. Beautiful salad. You’ve got gorgeous produce and the chickpeas are awesome. This looks like the salad of a gardener — everything is so fresh and seasonal. I especially love the way you used the carrots. A beautiful presentation. I’m going to try your brioche recipe w/ my boys this weekend. How much dry yeast would you use? I’m thinking 1 3/4 tsp.